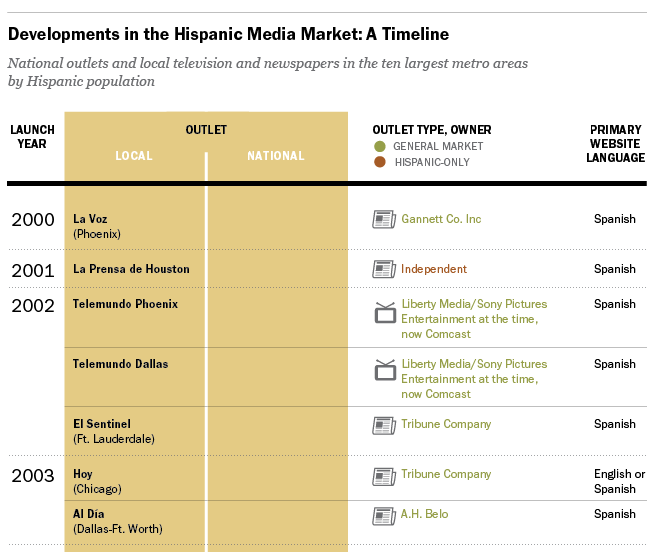 Media companies' interest in the booming Hispanic market increasing according to a recent timeline report released by the PewResearch Journalism Project. Providing a solid overview into the growth of media outlets geared towards the Hispanic market, the timeline highlights an important overview of the media landscape. "What’s clear from the timeline is that general market companies, those that also own outlets geared to the overall U.S. population have jumped into the Hispanic news industry in recent years. Six of the seven national outlets listed were started by these general market companies, including a handful that are partnerships: Fusion is a partnership between ABC News and a company focused solely on Hispanic media (Univision) and MundoFox is a partnership between Fox International Channels (owned by 21st Century Fox) and RCN Televisión, a Colombian broadcast television company." The fact remains that solid material geared towards the Latino market has the potential to garner significant growth and relevance among an audience that is hungry for quality content. There are obvious pioneers in the business of Hispanic media. Today, the energy around entrepreneurship combined with rising technologies has presented individuals and organizations with a great opportunity to satisfy the market's desire for relevant content based on insights, cultural affinity, and good judgement. It will be interesting to see the continued rise of winners and losers in this competitive landscape.